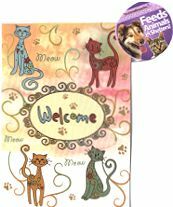 This mini garden flag (12.5" wide x 18" high) has four cats extending a welcome. The flag is made of 600 denier polyester fibers and the design is permanently dyed. It is weather proof, fade and mildew resistant. Machine wash cold water. With every purchase the manufacturer has made a donation to a site that feeds shelter animals. Flag made in the USA.